Sermorelin is a synthetic compound of the human growth hormone. 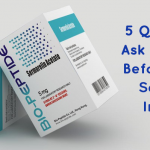 Comprised of a portion of the natural polypeptide hormone, it is made up of the first 29 amino acids within the 44 that are found in its natural state. The purpose of Sermorelin is to stimulate the pituitary gland into increasing the amount of growth hormone in the body. Sermorelin is now also becoming popular amongst doctors and are using them as part of their medical weight loss plans. Sermorelin was first developed within the United States during the early 1980s. By 1997, the Food and Drug Administration (FDA) had approved its use and sale via prescription. At first, its primary use was as a diagnostic tool for evaluating a possible deficiency in the production of growth hormone within the pituitary gland. Later, it was approved for use in the treatment of childhood growth hormone deficiency. Sermorelin has a history of being used as an acetate salt within the clinical setting. One method in which it is used is to measure its response within the body over a window of one to two hours after being injected with Sermorelin acetate. This is to diagnose a deficiency of the pituitary gland. A second use within the medical community is to treat growth hormone deficiency found in children. Due to Sermorelin’s ability to increase the levels of growth hormone within the body, an increase in height could be achieved as well. Because Sermorelin acts within a very specific way, it is valued for its therapeutic possibilities. It does not affect the levels or actions of glucose, insulin, prolactin, cortisol, thyroid hormones and a host of other compounds within the body. It should come as no surprise that athletes became interested in Sermorelin’s effects on the body. This is because of its similarities to recombinant human growth hormone (HGH) therapy in the form of injections. Elevated levels of growth hormones support many of those attributes that athletes find attractive including an increase in the growth of muscle tissue, improved energy levels, increased strength and the formation of more connective tissues. Because Sermorelin increases the body’s metabolism and improves energy levels, it has also been shown to have a beneficial effect on weight loss in those people who want a more natural approach. Sermorelin stimulates the body to increase its production of human growth hormone which improves the efficiency of the body’s metabolism in terms of the foods that are ingested as well as the fat already stored within it. Need more information about the possible effects of Sermorelin and your weight loss? Contact your weight loss doctor for a complete assessment to determine if Sermorelin is right for you.